Ever since I made the Red White & Blue Sports Drink Popsicles for July 4th, I’ve been sort of obsessed with icy foods and drinks. At the heart of the summer it’s almost impossible to feel fully hydrated and I feel like I’m visiting the freezer for crushed ice in water all day long. Unlike dairy-based frozen desserts which can make you thirsty, juice or water based desserts really do help with a sweet summer cool down. Adding champagne to that formula takes it all up a notch still! 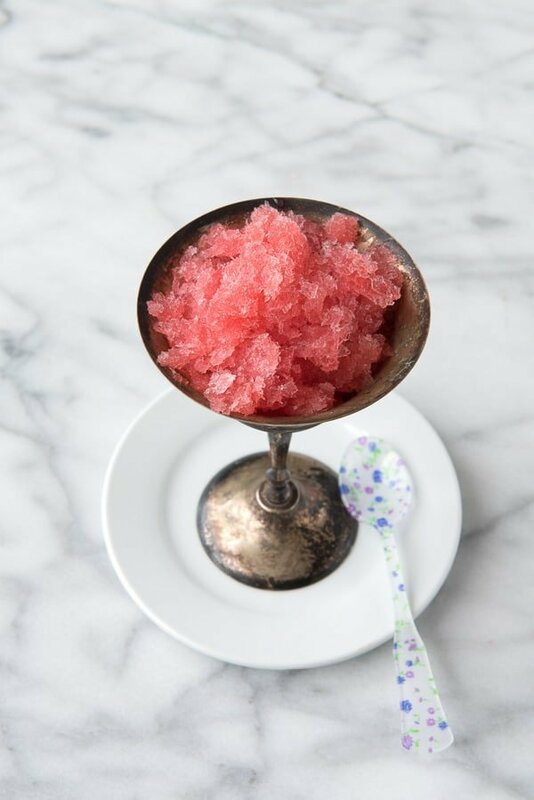 I decided to couple ruby red summer-ripe raspberries and pink champagne into a luscious granita. For those who may not have tasted or made one, it is a simple dessert made from sweetened liquid, frozen and raked with a fork during the freezing process to result in a snow cone textured dessert. The alcohol prohibits a hard freeze making a satisfying icy-slushy texture. The end result is visually beautiful deep pink dessert with the heady perfumed flavor of raspberries as well as champagne. 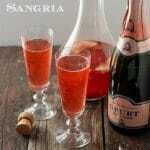 It’s a sophisticated quencher for a hot summer’s night as well as an elegant end to a celebratory dinner. 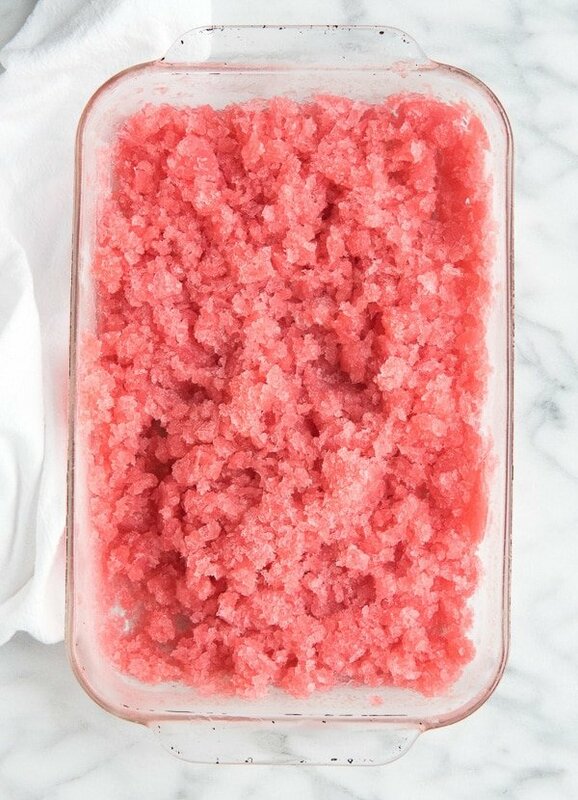 Granita is an easy dessert to make in fact I make it in the evening and let it sit in the freezer overnight. The champagne lengthens the freezing time so making it and leaving it alone for 8-10 hours leaves it ready to be raked and served. 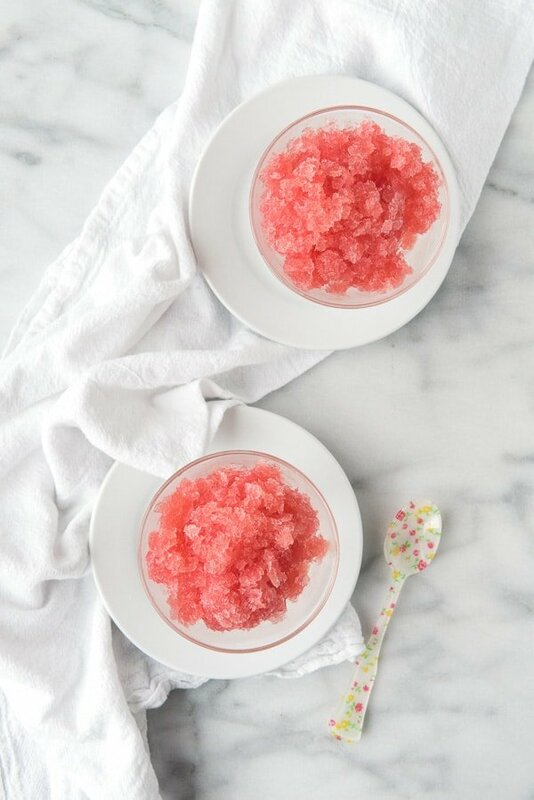 Granita has an icy-slushy texture that is a great finish to any meal whether in the heat of summer or after an elegant dinner. 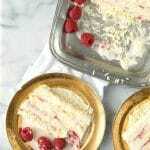 Raspberries add a perfumed quality to the pink champagne making this recipe extra special! The alcohol slows the freezing process so it does well to stay in the freezer all day or overnight. Once frozen (it will not hard freeze), a simple rake of a fork creates ice crystals that melt in the mouth with loads of flavor. In a medium saucepan, combine the sugar, water and raspberries and bring to a boil over medium-high heat; stirring to dissolve the sugar and mash the raspberries. Once the mixture comes to a boil, turn off the heat. Use an immersion blender to pulverize all the raspberries and allow to cool fully (about 1 hour). Alternatively allow the mixture to cool slightly, pour into a blender and puree, return to the saucepan to cool fully. Once cooled, pour the mixture through a fine mesh sieve (strainer) using a spatula to push the mixture through leaving the raspberry seeds in the sieve into a freezer-proof 13x9 inch pan. Scrap the outside of the sieve into the pan as well. Pour the champagne and the lime juice into the pan and stir to fully mix. Cover and place in the freezer for 1-2 hours. Check the granite and if the mixture is beginning to freeze break up the ice with a fork. Cover and leave in the freezer for 8-10 hours until the mixture is fully frozen. 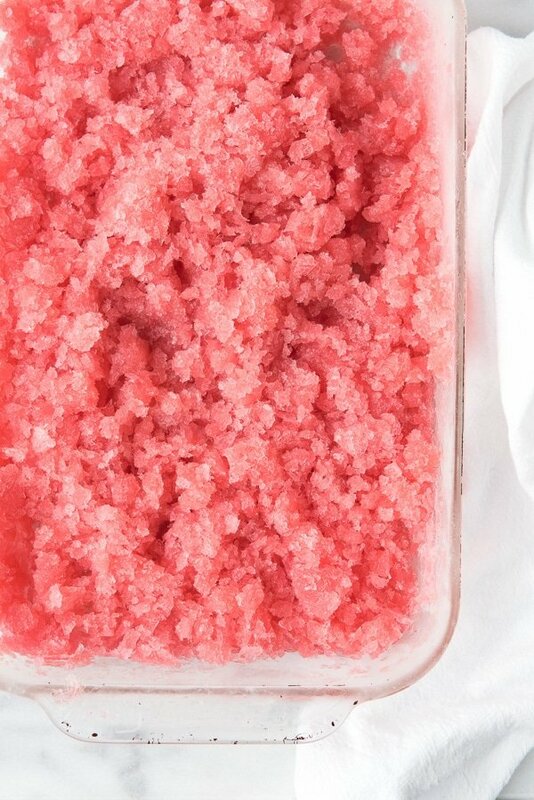 Remove the granita from the freezer and drag a fork through it to break up the mixture into ice crystals. 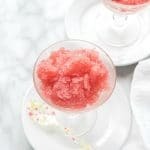 Unlike a traditional granita, the alcohol content will prohibit it from hard freezing so breaking up the mixture should be easy. After grating into small crystals, spoon into serving dishes and serve immediately. Leftover granita may be stored in the freezer. This sounds delicious! I have never tried frozen champagne. Champagne and icy summer slush? Sign me up! It’s beautiful! That color is just so pretty and I’m loving that you added Champagne to this! I’m with you on needing water or juice based stuff like this in the summer! A refreshing granita is my favorite this time of year. I woudl love to enjoy a nice cup of this! 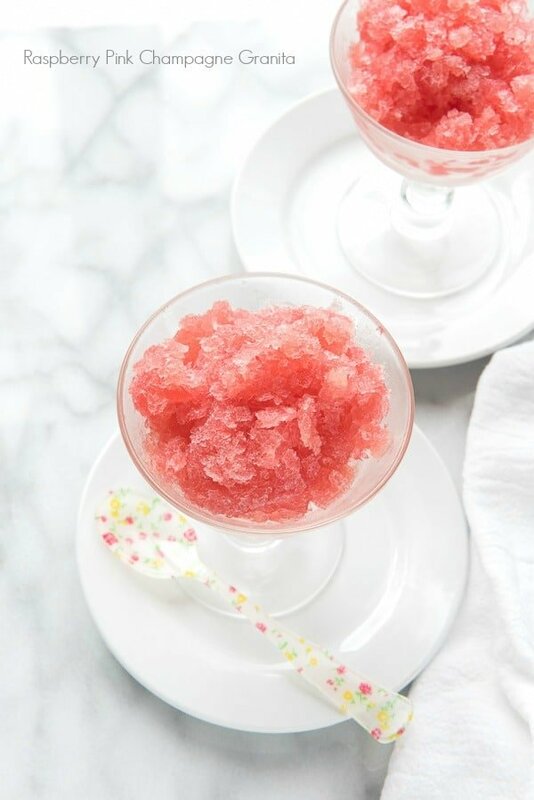 Rose champagne is one of my all time favorites and I love the creative idea of a granita. Since I originally had one at a fine dining restaurant, they always make me feel so fancy. There is something fancy feeling about them, Marcie, I agree. It’s funny because they really are so simple to make with few ingredients. No one has to know that when you serve it yourself of course! I think this is such a great idea. I love the pretty pink too. I love the pink too Rosey! Something about a pink dessert gets me every time! Yum! This looks so delicious! I love granitas and get my oldest to help with the scraping when we make them! The color of yours is so beautiful! I love that your kids help Sabrina. I feel getting them in the kitchen is such fun and helps them get excited about cooking too! That looks so pretty. 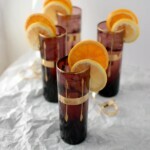 I will have to see if I can change up the recipe since we don’t drink alcohol. This looks so refreshing. The weather has been so hot this would be a nice treat. I will have to try making up a batch. This is such a great idea and it sounds yummy. It would go perfect with brunch by the pool. I love the color of this along with your cute little spoons and it looks so… refreshing! You have a special gift for making gorgeous pink alcoholic treats – this one is incredible, what perfect dessert for a wedding shower! This looks so refreshing and love the color! The photos are gorgeous too. 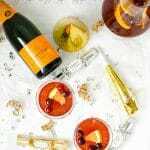 Wonderful recipe – I am very intrigued by the champagne! I need that in my life. Like today. It sounds ah-mazing and I cannot wait to try this.